Seen at Ellis Boston Antiques Show – this weekend! 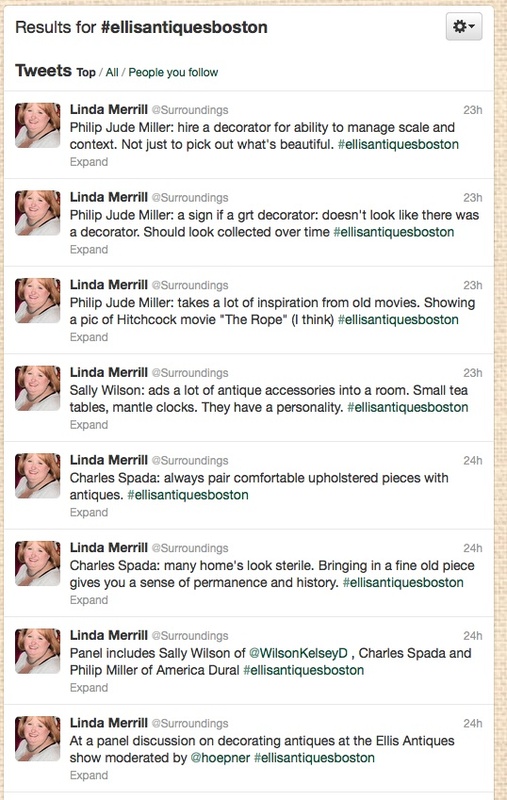 I always love attending the Ellis Boston Antiques show, going on this weekend, and this year feels like the best yet. There are 40 dealers and galleries participating in this year’s show. The furniture, art and jewelry (oh, the jewelry!) were inspiring. I didn’t take photos of jewelry – too heart breaking to have to walk away from some of those sparklers! Here is some of what caught my eye. The show is going on through Sunday, so if you’re in the area and love antiques, or want to learn more, it’s worth the trip. They also have seminars throughout the weekend as well. I loved everything at Margaret Doyle‘s stand which included an eclectic mix of traditional antiques to industrial age pieces – very steampunk. Marcoz Antiques – very traditional; very, very beautiful. European and Scandinavian antiques. Loved this quartet of Swedish mirrored sconces from Alexander Westerhoff Antiques. Loved this small marquetry box from Essex Antiquarians. The tumbling block quilt pattern rendered in different woods – gorgeous. My friends Diana and Scott Cooper of Trianon Antiques made their first appearance at the show – and produced a gorgeous stand featuring some of the best of their French antiques. How gorgeous is this lapis lazuli pot?? These pieces from John Sidelli Fine Art in Maine are right up my New England design aesthetic alley. How gorgeous is this harvest table, circa 1850? And finally, this Ralph Cahoon “Man With Telescope” wood carving, known to be one of only two in existence, from Roberto Freitas American Antiques. Love, love this piece. Still time to get to the show, info here. Have a great weekend! I’ll be dreaming of all the beautiful jewelry I couldn’t afford!